Our price for this DVD is $4.95 which just covers our cost. Add this DVD to your order and remember Walter! If you prefer, you can send us a check. This DVD presents Gerry Roach’s unique interview with Longs Peak legend, Walter Tishma. 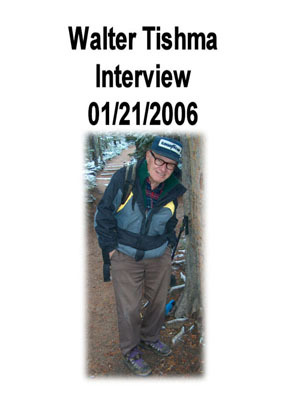 Gerry did the interview on January 21st, 2006 while Walter still lived in his beloved home in Estes Park. Nestled into his favorite chair, Walter poured out his stories about making well over a hundred ascents of Longs Peak while performing an exemplary civil service as a volunteer ranger at the Longs Peak Trailhead. Most climbers who know Walter met him on the Longs Peak Trail. In the interview, Walter describes how he came to America and discovered race cars, then how he retired to Colorado and discovered mountains. He also touches on his European roots. After you watch this hour-long conversation with Walter, you will better appreciate this remarkable individual. Stan Havlick made this interview possible, and Larry Chapman of Fort Collins Video taped the interview and produced the DVD. Our intent with this DVD is to make Walter more available, not to make a profit. The modest charge is to cover costs.